Our flight to Brazil was quite pleasant. The first thing I noticed when we left the airport in Brasilia was the extraordinary blue sky. The color was rich and vibrant. It was a blend of mystery and beauty. Indeed, it was God's glorious creation. When we arrived at the St. Rita Posada in Abadiania, Maria, the owner, greeted us. We were her only guests. After freshening up, we headed to La Casa, which was a three-minute walk from the Posada. 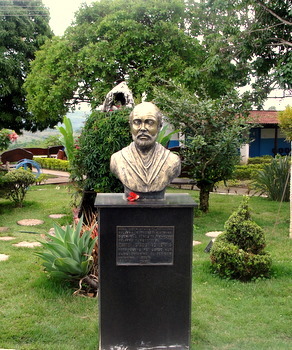 When we entered the grounds of La Casa Dom Inacio, there was silence all around us. Few people had gathered to meditate or pray silently. La Casa is in full operation Wednesday, Thursday and Friday. The rest of the week, people can freely walk the grounds, meditate and/or pray. Our first visit was to the meditation or main hall, which I called the triangle room. The room is attached to the main building and is accessible to the public every day. Here, people meditate, pray, and/or congregate before consulting the entities. On the front wall of the room, a wooden triangle is situated. People, who wish to attain healing for others, can place their pictures and/ or written messages there. 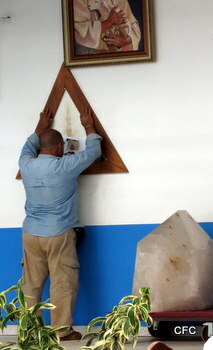 Moreover, the triangle is used as a praying tool. People rest their hands and forearms on the sides of the triangle, position their foreheads in the center, close their eyes and pray (see picture below). When I went to the front of the room and did the above mentioned, I felt immense energy entering my body. At one point, I saw a ball of light in front of me pulling me toward the center. The experience was as no other I had experienced in the past. The energy in the room was pure, intense and extremely powerful. Later, we went to the veranda or observation deck overlooking breathtaking and entrancing hills. We sat quietly, enjoying the beautiful scenery and spiritual energy around us. I felt that with each breath, my connection with spirit was growing stronger. Our energy was becoming one. When I asked my friend why there was so much spiritual energy around us, he stated that besides the presence of spirits being there, La Casa Dom Inacio was built on land covered with natural quartz. Because of the stone's spiritual and healing properties, it was the principal reason why the entity selected the area. Furthermore, the locale is believed to be a spiritual gateway between this world and the spirit world. 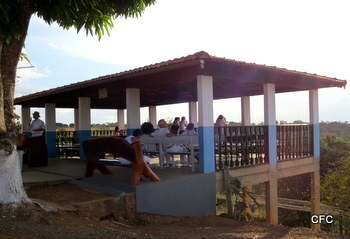 On Tuesday, a day before the activities at La Casa Dom Inacio, we went to a waterfall in a town called Corumba. There, in the presence of God, Yemaya and nature, I deposited my beads. I thanked Yemaya for her many blessings, threw the beads into the water, and cleansed myself. The experience was awesome. (Click here Yemaya beads to read about my spiritual beads). On Wednesday, we left the Posada early and headed to La Casa Dom Inacio. When we got there, a large crowd had already gathered. Immediately, we got our tickets. These tickets are free, and required in order to consult the entities. Next, I wrote three questions on a piece of paper, and had them translated into Portuguese. The three questions consisted of personal issues that I wanted the entities to help me resolve. With a ticket in one hand, and my questions in the other, I sat in the triangle room and waited patiently. There were four groups waiting to enter the room. 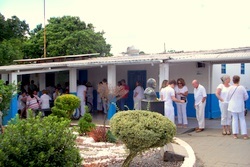 One group consisted of individuals attending the current rooms- these rooms are where people meditate and provide good vibration or current for the entities to perform their work; another group was made up of individuals who were going to have spiritual surgery; and the last two groups were first and second-time visitors. Since I had previously given my picture for distance healing, I was considered a second-time visitor. When my group was called, I quickly got on line. As we walked into the first current room, we were given blessed water to drink. As the line continued to move, I began to feel strange. My eyes started to get teary. I wanted to cry, and did not know why. As I got closer to John, the medium, I signaled a translator to assist me. I gave him the paper with the three questions and asked him to speak for me. When I approached the medium, who was incorporated with an entity, he took my hand and made eye contact. When the translator proceeded to read my questions, the entity spoke a few words and quickly wrote something on a piece of paper. The translator told me that I needed to purchase some herbs. Then, he directed me into another room. As I walked into the room, I, as well as others, was told to sit, close my eyes and pray. One of the volunteers began to guide us into a brief meditation. By this time, I was emotionally overwhelmed with all that had transpired in such little time. When I left the room, tears were rolling down my face. 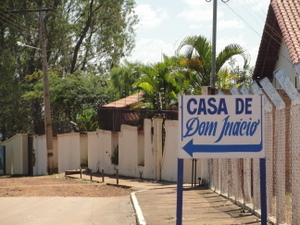 My next stop was La Casa Dom Inacio Dining Area. I was given a bowl of delicious "healing soup." The soup was free, and part of the treatment. After eating the soup, I needed to get away from the crowd. I left La Casa Dom Inacio and headed to La Posada. When I got to my room, I decided to close my eyes and rest. Resting, but still alert, I was startled by a loud knock on the door. Assuming that my friends had arrived from La Casa Dom Inacio, I immediately got up and opened the door. To my amazement, there was no one in sight. I looked everywhere, and found no one. The only individuals on the second floor were my friends and I. Moreover, we were the only guests. When my friends arrived from La Casa Dom Inacio, approximately thirty minutes later, I told them what had occurred. One of my friends said that the entities were known to visit individuals in their rooms. According to him, it was part of the healing process. Later that night, while waiting to fall asleep, I opened my eyes and saw the figure of a man entering my room. He walked across the room and quickly disappeared. Upon seeing this, I screamed. When I realized it was a spirit, I calmed down. I felt he was there to help, and not to harm me. I closed my eyes and immediately felt asleep. The following day, I got up early and headed to La Casa Dom Inacio. This time, I decided to sit in the current room. There, I took a seat and waited for further instructions. The atmosphere in the room was very relaxing with entrancing background music playing. A few minutes later, a volunteer appeared and told us to close our eyes and meditate/pray. Even though the woman kept speaking, helping us to relax and let go, I lost track of what she was saying. I immediately found myself drifting away. I started having vivid visions. The visions felt so real that upon awakening from a self-induced trance it took me a few seconds to realize that they were just visions. When the morning session was over, I felt revitalized. In the afternoon session, I went back to the current room. The initial process was similar to the morning session- closing eyes, relaxing and meditating. As I slowly began to drift away, I began to experience an unusual sensation all over my body. It felt as if someone else was controlling my body movements. I began to rub my head, arms and legs, as if cleansing or removing something, in an uncontrollable manner. Even though part of me wanted to stop or control my body movements, I could not. Furthermore, my breathing was deep and rapid. The behavior continued throughout the entire session. When the session was over, I went back to my normal state. In addition to attending the current room and consulting the entities, I received crystal-healing treatments and cleansed myself in the sacred waterfall. Due to the recommendation of one of the entities, I began to take crystal-healing treatments. Crystal treatments are given in a separate building within La Casa Dom Inacio. The area consists of various rooms. 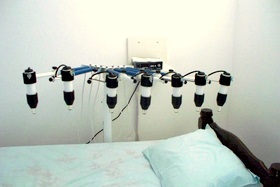 Each room consists of a bed, a chair and a mechanical device. The apparatus is made up of seven white quartz crystals. Attached to the top of each crystal is a different colored light corresponding to the seven chakras of the human body. According to La Casa’s literature, crystals combined with colored lights, and hitting the different chakras will align and balance the person’s energy field creating a deep relaxing and healing sensation. On one occasion, I was on one of the treatment beds with my eyes closed. The machine was on and functioning properly. During the session, I felt the presence of a person standing next to me. In my mind's eye, I saw a man in a white medical coat staring at me. His presence was so strong that I instantly opened my eyes. When I discovered that the room was empty, I closed my eyes again. The sensation and presence remained the same throughout the session. La Casa Dom Inacio Sacred Waterfall is a must. However, in order to attend one must get permission from the entities. 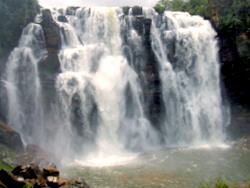 The terrain where the waterfall is located is considered sacred. The place has a magical feel to it. On the day of my waterfall adventure, my friends and I got up very early in the morning. As we walked down the hill to the sacred location, I could feel the morning chill embracing my body. "How am I going to do this when I am freezing," I thought to myself. I saw it as an arduous task- a task that I believed I could not achieve. Being cold is not something that I relish. The closer I got to the waterfall, the colder I got. I began to pray to the entities for strength to carry out my mission- to cleanse myself in the sacred waterfall. As I stood in front of the waterfall, I said to myself, "It's now or never." I immediately dipped my head inside the waterfall, and then, my entire body. Although the water was extremely cold, my body was fine. In fact, I felt my body warming up more and more. The water was so stimulating that I did not want to leave. After five minutes, the amount allowed in the waterfall, I said my farewells, and thanked the entities for their assistance. Pictures of La Casa Dom Inacio Waterfall are not posted on this page since it is forbidden to take pictures of the sacred area. When I reached the end of my journey, I felt renewed and ready for a new beginning. My visit to La Casa Inacio opened up a part of me that was dormant- a spiritual part that needed to be activated. I thank all the entities from La Casa Inacio for the experience and assistance. These spiritual books are riveting, action-pack, vivid and highly readable adventure that will captivate the readers’ attention. In Spiritual Journey, you will be able to travel with the author on her spiritual journey as she explores the various spiritual practices around the globe; in Spiritual Tales, you will witness the transformation of the characters while the depth of the spiritual messages given by spirits unfolds. If you love inspirational and thought provoking stories, you will enjoy these book. Don’t wait any longer and purchase these books. Join the adventure and enjoy the artwork created by the author that gives more life and meaning to each story.